Details: Stone cornice with dentil course; one story stone entry volume with cornice and dentil mould; flanking octagonal columns with Art Deco floral motif capitals; large Chicago windows; two story octagonal columns with Art Deco floral motif capitals. 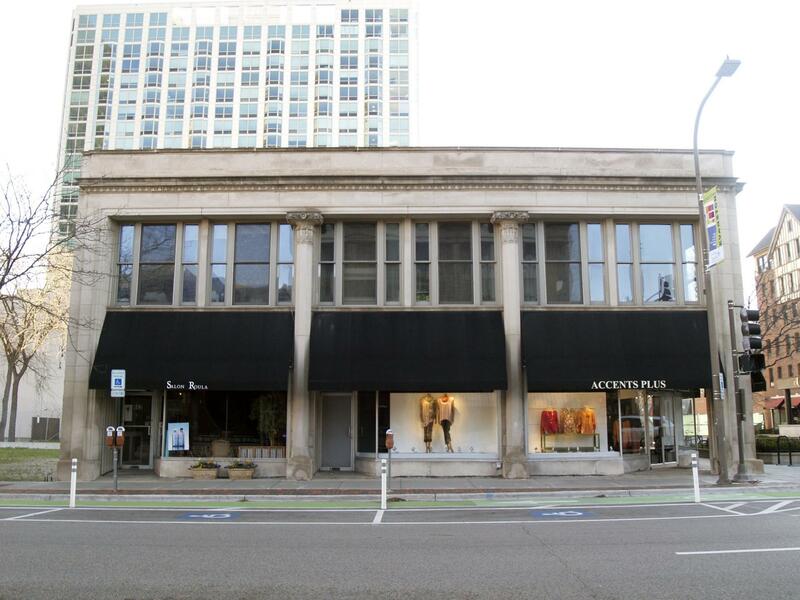 Historic Features: First floor commercial storefront with offices above; stone cornice with dentil course; principal east elevation is symmetrical with protruding one story stone entry volume with cornice; flanking columns with Art Deco floral motif capitals; large Chicago windows above, separate by stone, and grouped with stone bands; south elevation facade is mostly glazed with two columns dividing it into three bays; main floor on both elevations has original aluminum storefront with vertically ribbed panels at entries. Exterior Alteration Permits: BP#18248, 1928.08.01, 1604 Chicago Ave, 2-sty brick bldg improvement $2,000. owner C.A. 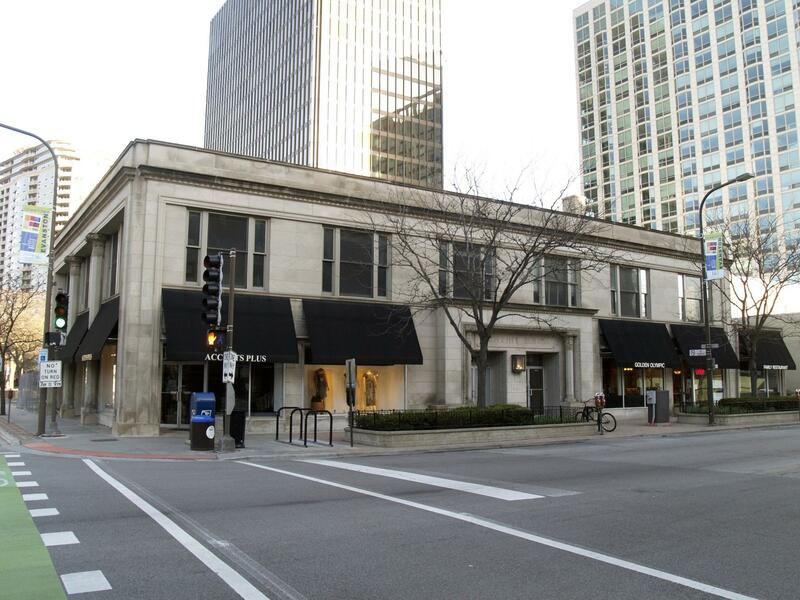 Wightman, archt Maher & McGrew, mason/carpnt J.B. King; BP#32147, 1956.07.03, remodeling of storefronts on 3 bldgs (1606-08-10 Chicago Ave) $5,000. owner Geo. Miller; BP#37521, 1965.10.06, 1608 Chicago Ave 1-sty restaurant $1,000. Owner Dean Arhos; 11roof-0207: roof; 13roof-0322: remove and replace portions of flat roof; 08mswk-0077: repair masonry on first flr of one flr bldg, N elevation; 09mswk-0127: masonry repair E parapet wall; 09extr-0317: install sliding doors - one exter. 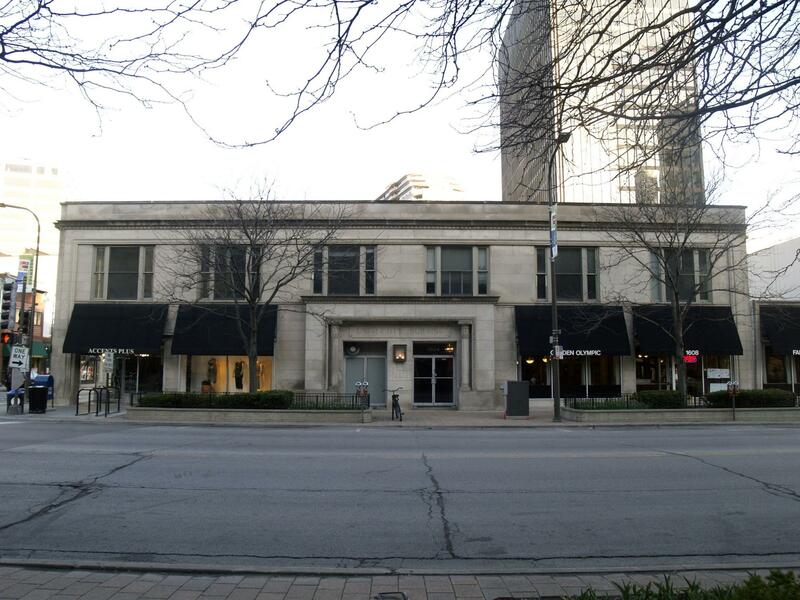 COA Info: 02HIS00000001: Storefront alter., removing one entrance and replacing it with a new window; installation of limestone base under new window to match existing limestone on storefront; 07HIS0000000031: (601-603 Davis) Parking area paving and alteration to site feature listed as Major Work; clay masonry wall cleaning on north side of building and tuck-pointing where required; 08PRES-0191: north elevation masonry repair as needed; 09PRES-0074: rebuilding the interior common brick parapet on the east side elevation; 09PRES-0202: repairing parapet brick wall on the east, south and west upper elevations of the building; 11PRES-0114: replacement of existing roof with new in-kind materials; 13PRES-0173: install roof vapor barrier, a layer of 1/2" insulation with asphalt. Historic Info: Evanston Landmark. Statement of Significance "This outstanding building represents George W. Maher's successful application of Prairie School architectural principals to a commercial structure in an early 1900's suburban setting..."